“Beirut Rockers leave listeners wanting more. Hard work often brings as many rewards as luck - a truism that certainly applies for the five members of the Beirut-based band The Kordz. The band - Moe Hamzeh on vocals, Mazen Siblini on keyboards, Nadim Sioufi on guitar, Paul Oueijane on bass, and Souheil Moukaddem on drums - has been grinding it out for almost 12 years, with few changes in line up, and they finally seem poised for major international success. 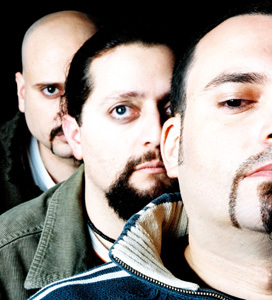 Formed in 1992 by Moe Hamzeh and Samer Ibrahim - then students at the American University of Beirut - along with Mazen Siblini, the band went through a number of early staff changes before stabilizing. They also struggled, at least initially, for places to play. But after debuting at a 1992 Beirut beer festival, they worked hard, building up a long list of gigs. That included gigs at universities, as well as in the Lebanese cities of Tripoli and Sidon - and even a show in a war zone - at a United Nations military compound in the occupied South of the country in 1995. The hard work and constant playing soon paid off, and word began to spread; it wasn’t long until The Kordz were one of the most well-established bands on the Lebanese scene, and their high-energy gigs drew an ever-increasing throng of fans. Even so, it took several years of pounding out shows at pubs across the country before the band landed a weekly slot at an underground Beirut nightspot called the Keller (rhymes with cellar). From there, success bred success, and more play dates - with bigger audiences - followed. As for what The Kordz sounds like, “great rock” is a phrase that springs to mind. The band’s live shows have inspired legions of dedicated fans, and the quintet is known for shaking more than a few rafters during the course of a night’s work. Interview de Moe Hamza, chanteur du groupe de Rock libanais The Kordz, à l'occasion du concert de ce groupe lors de la troisième édition du Festival Méditerranéen de la Guitare.